Our body is delimited from the environment by epithelial barriers, which also allow bi-directional transport. The epidermis of the skin (1) protects the outer surface. Thinner and mostly mucous epithelia line the respiratory tract (2), the digestive (3) and urogenital tracts. Nanoparticles may enter into the body by these different routes. 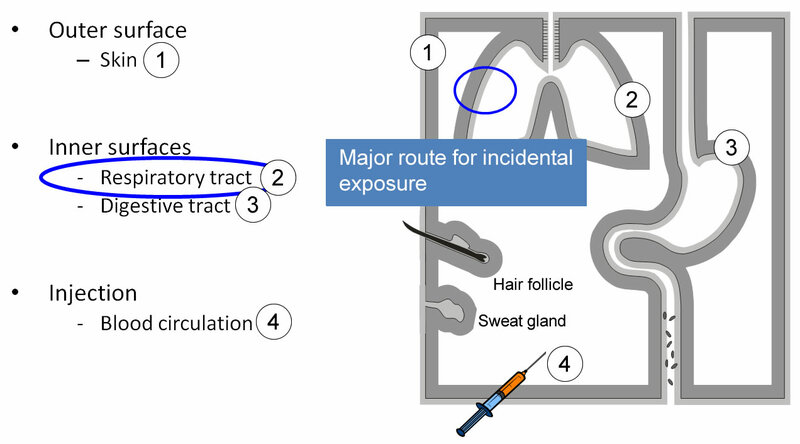 The lungs are considered as a major route of incidental exposure. Epithelial barriers are penetrated by injecting nanoparticles (4). Inhaled nanoparticles deposit onto the lung surfaces by diffusion, hence with high efficiency and in the entire respiratory tract. Nanoparticles in powders, dispersions or sprays pose a yet unknown risk for incidental exposure, especially in persons with lung disease, children and the elderly. Safety testing of abundant engineered nanoparticles (ENP) is performed in cells from normal and diseased lungs using the novel, portable and realistic nano aerosol deposition chamber NACIVT. Safe application of the quickly growing nanotechnology requires a comprehensive clarification of effects on people and the environment. Inhalation of ENP in the processing industry and by consumer products poses a yet unknown risk. Thereby individuals with chronic lung disease, as well as children and the elderly are expected to be more vulnerable than healthy adult subjects. Safety testing needs to include studies in the susceptible population. Furthermore, for efficient, economical, and ethically sound toxicity testing, animal-free test systems are needed that represent real inhalation conditions. This research aims at assessing health impacts of inhaled, widely used ENP on healthy adults and persons with the most prevalent lung diseases using a specially developed test unit. Experiments are performed using cell cultures that replicate the primary target of inhaled particles, i.e., the airway epithelium. We investigate whether and how the most important defense systems of the lungs are affected by the nanoparticles and whether the inflammatory response of the airway epithelium altered. We expose the cell cultures in the new aerosol deposition chamber NACIVT to ENP out of a continuous air-stream, like within the respiratory tract. The chamber is mobile to be used at any particle source of interest. Dose-response curves are established in cell cultures from normal and diseased human donors. The research aims to better understand the potential toxicity of inhaled ENP and the underlying biological mechanisms. The newly developed system is unique as it fulfils all requirements for realistic in vitro testing: accurate aerosol deposition, cell cultures replicating the inner lung surface and quantitative measurements of relevant cellular responses. The system is versatile, as it can be used for a wide range of particles, cell cultures and particle sources. The anticipated comprehensive combined mechanical and biological unit will likely advance the knowledge about possible adverse effects of inhaled ENP to the respiratory system. Currently, NACIVT is already used by renowned researchers at universities and companies in the USA, in Canada and in Europe.